I made this cake recently for my Mum's birthday. I had two reasons for making it, one of which is somewhat selfish. Firstly, Mum absolutely loves lemon flavoured sweets and so this was my primary motivation for choosing this recipe. The other, was because I am on a self-induced chocolate ban until Christmas Day. Had I made a chocolate cake instead, I wouldn't have been able to sample any to make sure it was up to scratch. There was method in my madness. As for the chocolate ban, I have been (chocolate) sober now for 4 days and I'm going strong, only 41 more days to go. Wish me luck! 1. Preheat your oven to 180'C (350'F/Gas 4). 2. Grease & line the base of an 8 inch (20cm) square cake tin with baking paper ( make sure it is fairly deep). 3. Beat the butter & sugar together until pale and creamy. Then, beat in the vanilla & lemon zest. Add the eggs one at a time, beating after each addition, until just combined. 4. Fold in the sifted flour in several batches until well combined. 5. 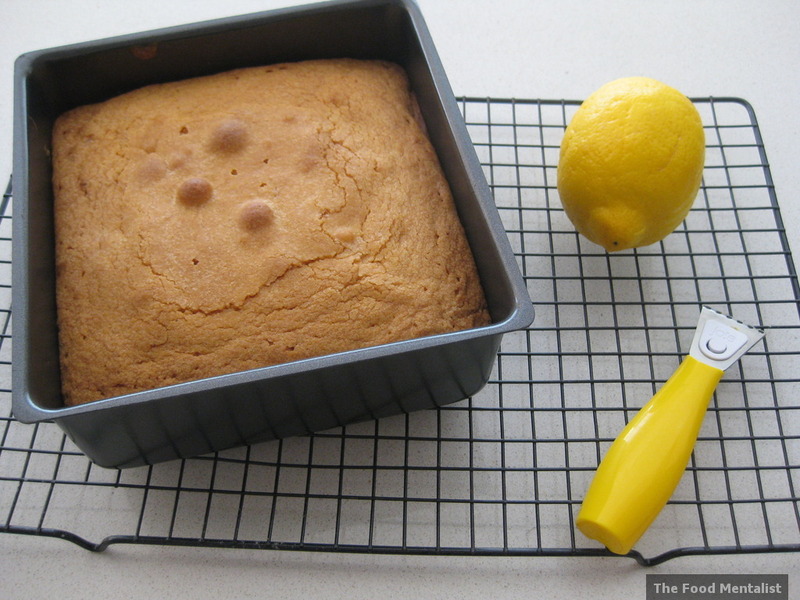 Spoon into your prepared tin and bake for 40-50 minutes, or until a skewer come out clean. 6. Cover loosely with foil if it begins to brown too quickly. 7. Cool for 10-15 minutes in the tin before turning it out onto a wire rack to cool completely. 8. 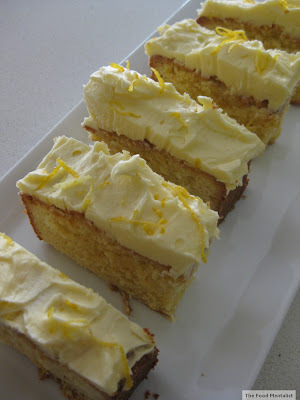 Once cool, ice with lemon butter icing and top with extra lemon zest if desired. Beat the butter with beaters until very soft and pale. Next, beat in the icing sugar , lemon juice and zest. Spread over the cake and enjoy! Such a beautiful, old style but fashionable, cake. Well done! 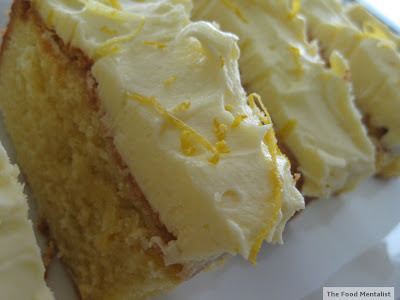 I love all things citrus, so I really would enjoy this cake. Glad it is in a smaller cake form, our family is not very big. 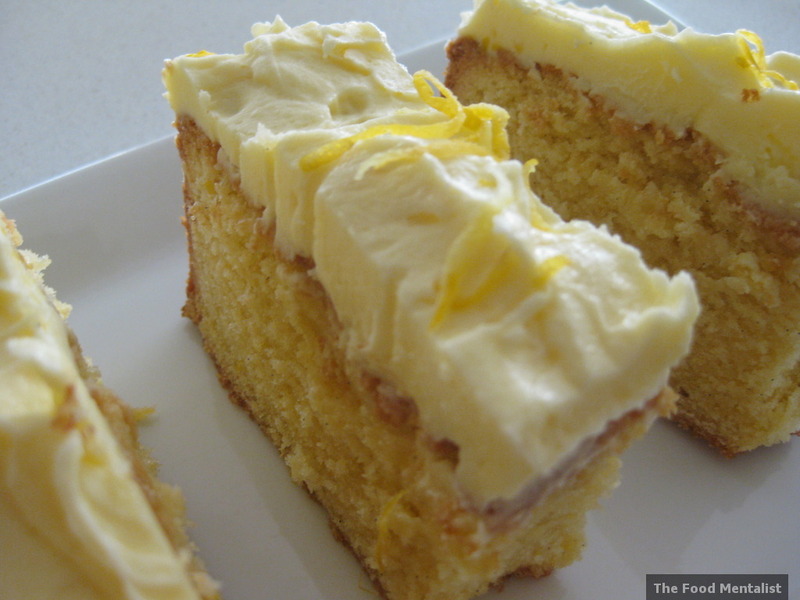 The texture of this cake, shown in the first picture, has me wanting to try a slice. Glad you posted this one! What a beautiful cake :) My family always request chocolate or citrus cakes for their birthdays too. Looks lovely and moist :) Although I hate the word moist, it really does look it! Oh my, I am drooling just at the thought of this cake! I love pound cake, especially with lemon! And that frosting looks amazing too! Tina, the texture of this cake is just gorgeous! Cass make sure you check out the Paul Foot skit on youtube about 'moist' cakes - it's hilarious! !